In a venue that is inspired by the Ema Ichi,a yearly summer marketplace in Takayama where traditional wooden plaques (used in the Shinto religion) are sold, you can enjoy the stands selling local cuisine and sake, or areas where traditional Japanese festival games are being played. Thegenre of the plays will change on weekly basis,and unclude stories about commoners in everyday life,historical events,and dancing performances. 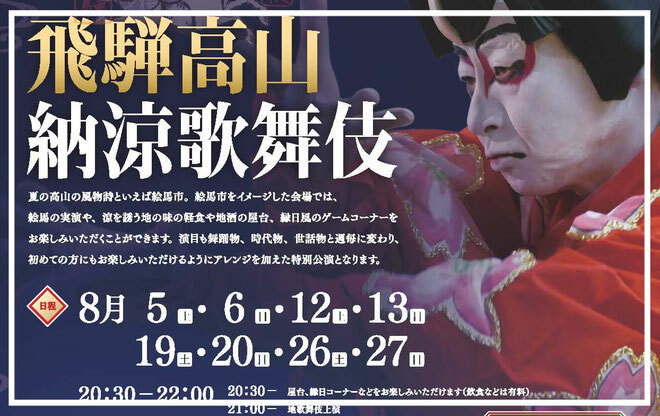 The performances are specially arranged so that even first-time Ji-Kabuki viewers can enjoy them. 8 minute walk from JR Takayama Sta.